Between trips to the feed trough (aka leftover goodies - thanks to our Thanksgiving hosts) I was able to quilt a lot on this Quilt of Valor. This afternoon I've started on the side setting triangles and the corners. I wanted something open, woodsy, kinda light and airy. So far, my little tabs from the basting gun have worked OK. I cut them off CAREFULLY before the needle hits them, but even when they get accidently sewed IN, I can use a tweezers to pull them out from under a stitch. The top flies off ... uhhh somewhere, and the bottom slides to the floor. So far, so good. None have dropped INTO my machine via the feed dogs - something I was warned about -- knock on wood. Can't wait to get this finished and spritz it, to see it all pucker up evenly! The last 3 borders will be done in a loopy viney, leaf/heart, across all three borders. That should go fast. Hi, Elaine! Your quilting is looking so good! Love the colors, too. Looking forward the big pic when it is all done. It looks beautiful! Love the fabric selection. I love the vines in the setting triangles! Loving this woodsy design you chose for the corners. Pretty, yet macho enough for a soldier. 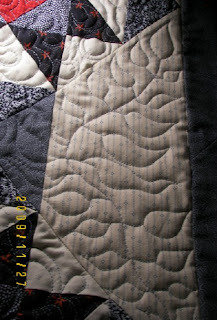 Love love love your quilting. You are a pro! Elaine - it is just gorgeous!! Wow, Elaine! 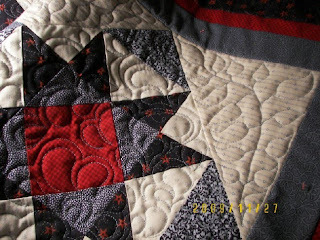 Gorgeous quilt, gorgeous quilting! wow you know what I think. gosh you just get better and better, my little Texas Hold''em. DOING IT is the art! huh? an explanation regarding "no reply"